"Salmonberry" redirects here. It is not to be confused with Rubus parviflorus. Rubus spectabilis, the salmonberry, is a species of brambles in the rose family, native to the west coast of North America from west central Alaska to California, inland as far as Idaho. Rubus spectabilis is a shrub growing to 1–4 m (40-160 inches or 1.3-13.3 feet) tall, with perennial, not biennial woody stems that are covered with fine prickles. The leaves are trifoliate (with three leaflets), 7–22 cm (2.8-8.8 inches) long, the terminal leaflet larger than the two side leaflets. The leaf margins are toothed. The flowers are 2–3 cm (0.8-1.2 inches) in diameter, with five pinkish-purple petals; they are produced from early spring to early summer. The berries ripen from early May to late July in most of the Pacific Northwest (later in cooler climates), and resembles a large shiny yellow to orange-red blackberry 1.5–2 cm (0.6-0.8 inches) long with many drupelets. 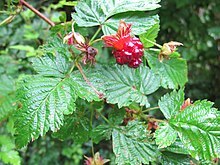 Salmonberries are found in moist forests and stream margins, especially in the coastal forests. In open areas they often form large thickets, and thrive in the open spaces under stands of red alder (Alnus rubra). Salmonberries are edible and share the fruit structure of the raspberry, with the fruit pulling away from its receptacle. The fruit has been referred to as "insipid", but depending on ripeness and site, they are good eaten raw and when processed into jam, candy, jelly and wine. They were an important food for indigenous peoples. Traditionally, the berries were eaten with salmon or mixed with oolichan grease or salmon roe. They were not dried because of their high moisture content. It is widely grown as an ornamental plant for its flowers. A double-flowered form was discovered at the mouth of the Duckabush River, Jefferson County, Washington, around May 1, 1961, by Dr. R. C. Creelman of Bremerton, Washington. This has been given the cultivar name 'Olympic Double' or 'Olympic'. Another double salmonberry was found by Phyllis Munday of Vancouver, British Columbia, but neither the date nor the site has been determined. This double may be confused in gardens with 'Olympic Double'. It has escaped cultivation and become naturalized in parts of northwestern Europe, including Great Britain, Ireland and the Faroe Islands. It is sometimes referred to as a Joffelberry and is used to flavour vodka. ^ "Plants of British Columbia: Rubus spectabilis". Linnet.geog.ubc.ca. Retrieved December 9, 2014. ^ "Jepson Flora: Rubus spectabilis". Ucjeps.berkeley.edu. Retrieved December 9, 2014. ^ a b Pojar, Jim; Andy MacKinnon (2004). Plants Of The Pacific Northwest Coast: Washington, Oregon, British Columbia & Alaska. Lone Pine Publishing. p. 76. ISBN 978-1-55105-530-5. ^ Mosquin, Daniel (2007-04-23). "Rubus spectabilis Double-Flowered Group - Botany Photo of the Day". Botanicalgarden.ubc.ca. Retrieved 2017-06-29. ^ Mulligan, Brian O. (1977). Woody Plants in the University of Washington Arboretum, Washington Park. University of Washington, College of Forest Resources, Seattle. ^ Inland Fisheries Ireland. "Risk Assessment of Rubus spectabilis" (PDF). nonnativespecies.ie. National Biodiversity Data Centre. Retrieved May 1, 2018. ^ Højgaard, A. et al., eds. (1989). A century of tree-planting in the Faroe Islands. Føroya Fróðskaparfelag, Tórshavn. "Rubus spectabilis". 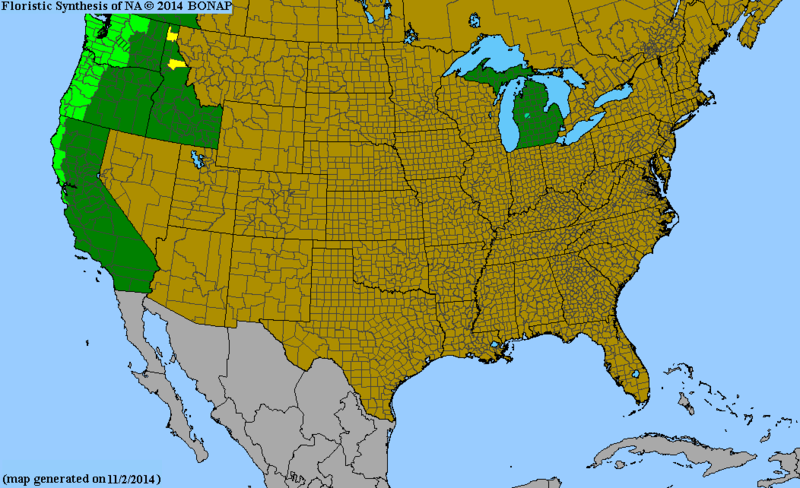 Natural Resources Conservation Service PLANTS Database. USDA. Retrieved 2009-06-30.